Mac The Ripper 3.0 is a free Mac DVD ripper and Mac DVD Extractor for Mac OS X. Mac The Ripper 3.0 removes CSS encryption, Macrovision protection, sets the disc's region to '0' for region-free and Mac The Ripper capable of removing RCE region checking. Mac The Ripper 3.0 can also copy ARccOS copy-protected DVDs. Mac The Ripper backup your legally-purchased DVDs onto hard drive easily. 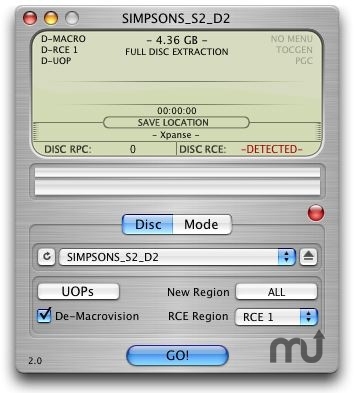 Mac The Ripper 3.0 is 100% free DVD ripper for Mac OS X users. ...... Mac The Ripper is made to backup DVDs you have legally purchased for personal use. You do not need to play the DVD with DVD Player in order to rip it to your hard drive. Mac The Ripper is also able to extract DVDs that have been damaged or improperly mastered. As Per The Forum Notice , The Build Signifies The End Of The Lifetime Of Free Updates. From Now On , There Will Be A Fee For Every Major Release Of The Application. If You Have Made Enough Gifts To Cover For A Multiple Seat License , This Does Not Apply , And You Will Receive Free Updates As Before. If You Have Gifted Within The Last 365 Days , This Updates Is Also Free. If You Are Outside The 365 Days , And You Already Have MTR 4.0 , Then The update Fee is $10. Qweas is providing links to Mac The Ripper 3.0 as a courtesy, and makes no representations regarding Mac The Ripper or any other applications or any information related thereto. Any questions, complaints or claims regarding this application Mac The Ripper 3.0 must be directed to the appropriate software vendor. You may click the publisher link of Mac The Ripper on the top of this page to get more details about the vendor.